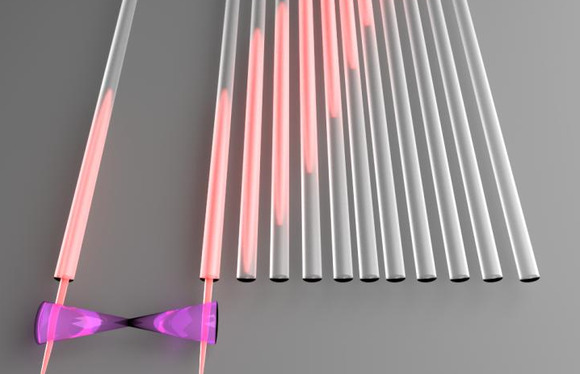 To prove their point, they demonstrated what’s known as perfect state transfer on a photonic qubit that’s entangled with another qubit at a different location. In traditional computing, numbers are represented by either 0s or 1s. Quantum computing relies on atomic-scale quantum bits, or “qubits,” that can be simultaneously 0 and 1—a state known as superposition. Quantum bits can also become “entangled” so that they are dependent on one another even across distances. Today’s microprocessors use data buses to route bits of information to and from memory. Transferring quantum information is trickier, because quantum states are so fragile—try to move a qubit, and the quantum state may change. To test out their approach, the researchers in this study turned to particles of light. Hailing from RMIT University in Australia, Italy’s National Research Council, and China’s South University of Science and Technology, the scientists used a technique by which quantum information is encoded in such particles, also known as photons. Using an experimental setup with multiple “waveguide” tubes, they tried to relocate the data among locations while achieving perfect state transfer, preserving the delicate quantum state of entanglement. In their tests, the researchers were able to perform the procedure while preserving the encoded quantum state with an average fidelity of 97.1 percent. Ultimately, the discovery could pave the way for a quantum data bus and bring quantum computing closer to reality, they said. Quantum computers could have much higher performance than today’s systems.